Just like westerns, comedies, musicals, science fiction, romantic pics, buddy pics, chick flicks or cops vs. criminals, World War II should be a movie genre unto itself, and not just a subgenre of the war movie category. If I were a betting man, I’d wager that out of all the movies taking place in a war-related setting, the number of movies set just before, during or just after the end of WWII would be way more than the number of movies set during any other war. WWII was so overwhelmingly and impactfully big that right now, almost 75 years since it ended, you can at this time see “Hacksaw Ridge” — a dramatized WWII movie — in a theater. Just like WWII still today has a ripple effect on American society overall, there are still reverberations from that war felt by today’s Japanese American community — after all, this month marks the 75th anniversary of President Franklin Roosevelt’s Executive Order 9066 arriving on the heels of the new American president issuing his own chaos-causing executive orders. And what of movies about the WWII era and this community? Excluding documentaries, there have been since 2001 the following independently financed (not from the big Hollywood studios) movies: “American Pastime” and “Day of Independence” (both “internment”-related with baseball backstories) and “Only the Brave,” about Japanese American soldiers of the 100th Battalion/442nd Regimental Combat Team. None could be realistically construed as having moved the needle with the greater American community about the Japanese American experience during WWII, sad to say. With no big studio interested presently in making a movie about the 442 (or the “internment,” for that matter), going the indie route has been and continues to be the only way to tell those stories, despite the astonishing achievements of the mostly Japanese American soldiers of the 100th/442nd. There has only been one such movie from a Hollywood studio, and that was MGM’s 1951 “Go for Broke!,” which starred the late Van Johnson, and as such, was really more about his journey from bigotry to brotherhood, with the Japanese American soldiers of 100th/442nd fighting the good fight in WWII while serving as his character’s vehicle for personal enlightenment. Now, however, there is cause for cautious celebration with another “Go for Broke” (note the lack of exclamation mark) in the works, and just from its pedigree, it’s more likely to focus on Japanese Americans, who of course should be the focus. 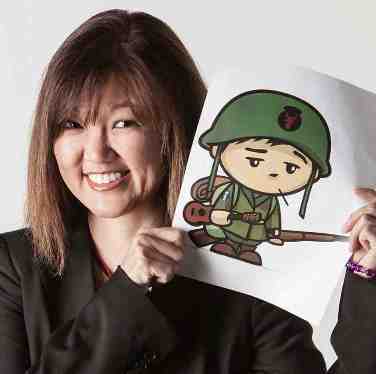 The big part of this new “Go for Broke’s” aforementioned pedigree is Hawaii’s Stacey Hayashi, who has dedicated the past 16 of her 41 years pushing to make a movie about the 100th/442nd, having made friends with many of its vets and, sadly, seeing many of them pass away over the years. 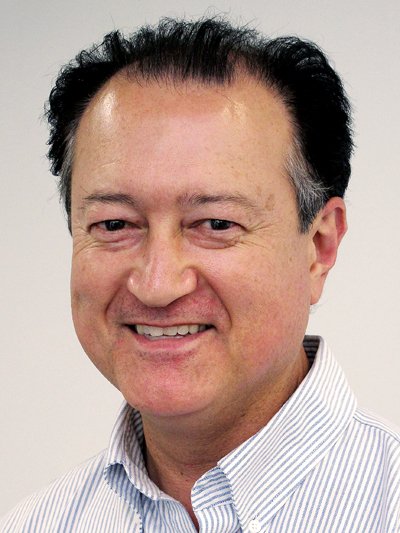 In last week’s column (http://tinyurl.com/jybkwoc), I spoke with director-actor Chris Tashima, who appears in this “GFB,” and he kindly connected Hayashi with me. She and I chatted about her incredible odyssey in trying to convey the 100th/442nd story to the masses. In addition to writing the screenplay and executive-producing this new “GFB,” Hayashi in 2013 also scripted and published a comic book, illustrated by Damon Wong, titled “Journey of Heroes: The Story of the 100th Infantry Battalion and 442nd Regimental Combat Team.” (See The Rafu Shimpo’s story at http://tinyurl.com/jhg6c7a) The comic is available at the Japanese American Museum Gift Shop (http://tinyurl.com/gs747m3) for $12. “This movie and the comic book, this past five years, has pretty much taken over my life,” Hayashi said. While she has an Internet-based business, it’s been back-burnered as she has focused her energy and attention on the media-related projects. Realizing that she couldn’t put the lives of her veteran friends on hold, she prioritized producing these projects so at least some of her vet buddies could see them before the inevitable occurred. That this new “GFB” has come this far is a story unto itself. In 2007, Hayashi applied through the 442nd Foundation for a “grants-in-aid” from the state of Hawaii for the movie project, which was approved, a rarity since “they never fund films,” she said. “It’s usually social service stuff.” It was for an amount less than what she eventually would receive, which would be about half a million dollars, a figure the expert on all things 442 felt was quite generous. So, she tried again after speaking with legislator friends who also attended Sen. Daniel Inouye’s funeral in 2012 at the National Memorial Cemetery of the Pacific, aka Punchbowl, Hawaii’s final resting place for so many American veterans. Disappointed that Inouye was unable to see the fruit of her hoped-for labors before he died, the politicians urged her to try again, which she did. Once again, the movie project was approved. Then, with money making the project able to move forward, there was another big problem telling the story of the 100th/442nd: size. 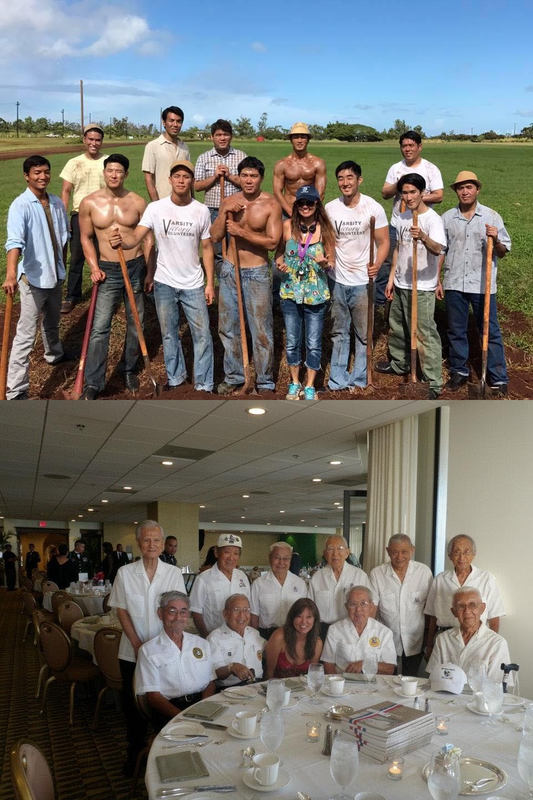 Stacey Hayashi with 100th Battalion veterans and the actors playing them in her film. The solution was to narrow the focus — and Hayashi reasoned that since the money came from Hawaii, the story should focus on events in Hawaii and benefit Hawaii, which was how she decided to tell the story after the attack on Pearl Harbor of the formation of the 100th Battalion and the people who helped make that happen. So, while the attack on Pearl Harbor is part of this movie, there are no battle sequences in North Africa or Europe. It’s strictly the genesis of the original 100th Battalion, which of course would later become the 100th/442nd RCT. Fast-forward to now. Hayashi and her crew recently took 20 days to complete principal photography in Hawaii. The movie is in postproduction, with a few key shots left to be completed, including a re-creation of the iconic shot of thousands of Nisei men in uniforms, leis around their necks, at Iolani Palace from March 28, 1943. Fitting for it being a Hawaii-based production, Hayashi’s friend, ukulele virtuoso Jake Shimabukuro is in charge of the movie’s music and even has a role in the movie. Turns out she also attempted to get YouTube superstar Ryan Higa on board about six years ago. Hawaii being somewhat of a small pond, she was able to get a copy of the script to him, via relatives.“I sent his mom the script and she liked it,” she said. Unfortunately, Higa himself did not want to do it. “Ironically, the kid we cast as young Daniel Inouye (Kyle Kosaki) and our art director are actually his classmates from Hilo,” she said. Nevertheless, she thought Higa — and his army of YouTube followers — would have been great. The interesting twist to this project, Hayashi said, is that there will be two final versions. One will be a 60-minute pilot for a limited series that could become the basis for a miniseries, a la “Band of Brothers,” and a feature-length motion picture that would go on the festival circuit and hopefully receive enough critical acclaim to get major distribution. In this day of Netflix and Amazon Prime Video, it’s not out of the question that a service like one of those could back it as a miniseries. What’s in it for Hawaii would be if a series ever were to be produced, it would mean lots of jobs for workers in the local motion picture/TV production industry. Exciting as this is, however, there are still obstacles to be overcome before this movie can reach its goal. That obstacle is, of course, money. As of now, there is no de rigueur Internet-based crowdfunding mechanism in place — but the nonprofit 442nd RCT Foundation, is accepting donations to help fund the film. Its address is 933 Wiliwili St., Honolulu, HI 96826. Hayashi has come this far, and I have to salute that. Hollywood can’t be depended upon to tell this tale. So, if you’re interested in helping that cause, give that a try and help Hayashi tell the “Go for Broke” story without her actually going broke. Book Giveaway Dept. : OK, last time out I made a call for people to visit Rafu.com, find the link to my most recent column and put in a comment below said column and be in the running to get a free copy of the book “Honor Before Glory,” which I wrote about Jan. 2. I did receive an email from Richard Murakami, who tried to do that and failed, only succeeding in getting an error message. I tried too and got the same result. So, there appears to be a problem. I’m going to put this giveaway on hold until the problem is fixed. Maybe this is why no one comments these days!